Parisian often consider as the most stylish individual, everything in their live always appear so stylish. That is why a lot of people become interested to Parisian home décor. 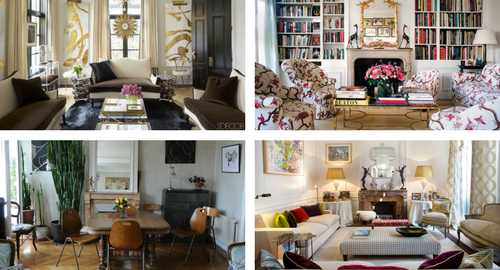 Parisian house is always so chic which make their style look different from other home different. It is almost like other thing in their live such as food, fashion, and of course the architecture, they are all done in high sense which makes them appear gorgeous. If you want to use this style to your house then you must use a few tips we share here. Parisian loves something classic, but they also keep following the trend. That is why you can see that their house is filled with classic and new items mixed together. So if you want to follow Parisian home décor style, then you also need to mix your old and new item together. You can try to put an old black and white picture in your modern designed room. Or you can also try to mix modern and classic furniture piece together. Classic items from all culture can be used such as antique China porcelain or batik table cloth. All of that will increase the value or your home décor to appear more luxurious. Most of Parisian apartment have less sunlight so it become darker and to cope with this problem they will use white background to make it appear lighter. So even though you have plenty of sunlight in your own apartment, you might still want to follow this habit to create authentic Parisian home décor. Furthermore with white wall painting your room will appear cleaner and more modern which is also another thing you want to have on your house. We all know that Parisian love something dramatic like drapery. That is why they use a lot of silk draperies which puddle on the floor to make it look more dramatic. You can try to apply this style on your house to get the same dramatic Parisian home décor effect. Of course you can use other kind of cloth for the drapery. The cloth will also add more deep to your interior design because of the texture it brings. So this is important to get the cloth into your design. Another dramatic Parisian home décor is the gilded mirror. We all know Parisian love luxurious things, and that shows in their use of gilded mirror in most of their house. Choose oversize mirror which will also make your room appear larger so this will become a big help if you have a small size room. The bigger the better as it will give even more dramatic effect. Of course you can use modern gilded mirror but usually Parisian use antique gilded mirror with craft on the frame since it will also add more beauty to their decorations. Last but not least is the use of French chandelier in every Parisian house especially since their apartment has high ceilings so it will look good to decorate the ceilings. They want the chandelier to look old as if it was already there from old time ago. So try to find antique chandelier for your house if you can. But if not, there are still a lot of new chandeliers with distressed look so it will appear antique. Just make sure that the design is antique even though it is actually new pieces and place them anywhere you want around your house as Parisian home décor. If you have a lot of items, you can try to use eclectic style so you can add more items that you like whenever you like. This will also help you with mixing and matching old and new items that you found. Furthermore France is also known for flee market which often appear everywhere. And that is the place where Parisian found the unique items which they could use as accent of their house. Then they will add it on their design which usually match well since Parisian really have good taste in choosing items for their house. If you need to separate the space into several functions, then you can try to use a few rugs. As you know Parisian home décor apartment is adored by herringbone flooring which is very beautiful if you could also have it in your house. But because they use the hardwood floor it would create a lot of noise while walking on it. So a lot of Parisian uses rugs on their floor to reduce the noise and make the floor appear more beautiful. Try to find rugs with good pattern so the room will look more interesting.